The Procaer F.15 Picchio (Italian: "Woodpecker") was a utility aircraft developed in Italy in the late 1950s as a further development of Stelio Frati's Falco and Nibbio designs. Like its predecessors, the Picchio was a conventional low-wing cantilever monoplane of exceptionally clean lines, with retractable tricycle undercarriage. The prototype F 15 first flew on May 7, 1959. A fully aerobatic aircraft with control sticks and gull-wing entry doors. Wood construction with a sheet of aluminum bonded to the outer surface giving extremely smooth finish and excellent performance. All-metal control surfaces. It was the first Frati plane to have some metal in it The early versions of the Picchio shared the same wooden construction as the earlier designs, but had a thin aluminium skin over the top of their plywood skins. The F.15E and F.15F, however, were all-metal. Production of the early, wooden Picchios was carried out by Procaer in Milan. Procaer produced 15 aircraft of the prototype. 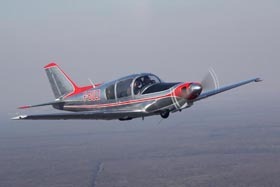 A second series of 54 aircraft were produced by Procaer. : The Picchio F 15A. First aircraft of this series first flew on March 16, 1960. This time with a single entry door on starboard side that hinged forward. A third series of 35 aircraft produced by Procaer in the mid 1960s : The F.15B Picchio It had increased wing area, larger wing tank and had the fuselage tank eliminated. The F.15C Picchio: Fourth series of aircraft by Procaer. The first aircraft of this series flew in 1964. It had a 260 hp engine, a fuel capacity of 84.5 gallons and wing tip tanks. With General Avia, Frati established his own factory to build his designs, commencing with the F.15E. Only a few examples were built, however, and the design lay dormant until revived by an Austrian company, HOAC. in the mid 1990s. HOAC arranged to have the two-seat F.15F model built at the JSC Sokol plant in Niznij Novgorod, but ran out of money, leaving Sokol with unsold airframes in various states of completion. Stelio Frati was born in Milan, Italy in 1919. He graduated in mechanical engineering from Milan polytechnic in 1943. At the end of the war in 1944 , Frati was invited to teach and he joined the Aeronautical section as an assistant professor . After teaching for a period of ten years , Frati started his career as a freelance designer in 1954 and he is known for several well known aircraft designs, one of them being the Falco F8L.